Available in British Tan Simulated Leather. 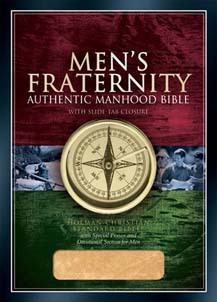 The Men’s Fraternity Bible will be a valued resource to men’s Bible study groups everywhere, especially among the 100,000 men across 5,000 groups worldwide now taking part in the Men’s Fraternity ministry based upon the video teachings of pastor Robert Lewis. Sherard. They have four children.